At GRIEB & BENZINGER we manufacture finest unique timepieces according to an inimitable concept. In our workshop, we completely restore invariably hand-picked and most precious movements by the great old masters from 1880 to 1930 in traditional manner. In the course of this, the movements are taken apart into their smallest elements, worked on, guilloched, engraved and skeletonized in order to make an individual client’s very personal watch dream come true. Thereby, the up to 130-year-old movement is repeatedly disassembled and recomposed, until every single of its functions as well as all technical details are perfectly tuned. In this way, old timepieces are turned into new masterpieces of indescribable exclusiveness. In our workshops, we in fact live and practise ancient watchmaker’s traditions and long-lost craftsmanship. Take for example the missing piece of an historic Patek Philippe minute repeater from 1905, which we reconstruct in classical handicraft using historical machines and techniques according to good old tradition. 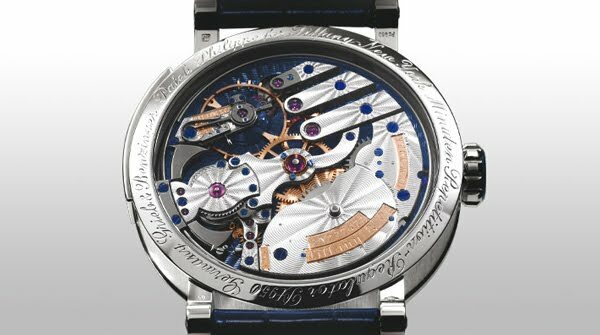 We completely rebuild the movement, skeletonize it by hand, engrave and gouilloche it – and all this without the original design drawing! True watchmaker’s skill, in keeping with the tradition of Abraham Louis Breguet. Here at GRIEB & BENZINGER, classic watchmaker’s art relives its prime. This watch concept, along with its realization, within the GRIEB & BENZINGER workshops is unique; considering a number of pieces of approximately ten watches per year, we offer you an eyot of exclusiveness within a market floated by mass luxury. Hermann Grieb and Jochen Benzinger find their source of inspiration in old masters of fine watchmaking such as Abraham-Louis Breguet and his apprentice Charles Oudin. Early on, Breguet recognized his apprentice’s talent and devotedly nurtured it. In the ensuing years, Oudin developed and constructed complicated movements for his former teacher. As early as 1820, Charles Oudin constructed blued movements—which are most rare these days. An homage to Oudin, all movements of the GRIEB & BENZINGER PLATINUM timepieces are entirely or party blue platinum-coated. 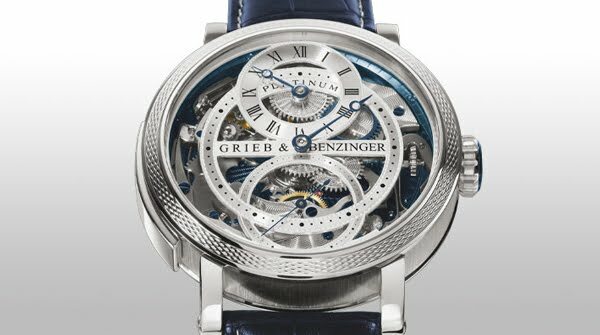 GRIEB & BENZINGER are the only watchmakers worldwide to consistently blue all movements out of respect for this great tradition. Solid 49 mm diameter platinum case with 130 grams platinum weight. Anti-reflective, domed sapphire crystal and flat sapphire crystal on the bottom. Crown made of solid platinum in inlaid with a blued-steel application. Screw-in sapphire crystal case back and hand-guilloché bezel. Navy blue alligator skin strap with platinum buckle. Hand-skeletonized Sterling silver dial decorated with an original Breguet frosted finish. The 36-jewel movement with manual winding is based on an original Patek Philippe minute repeater movement, exclusively manufactured for the famous New York-based jeweller Tiffany around 1887. The compensation screw balance with blued Breguet hairspring beats at 18,000 semi-oscillations per hour. In typical GRIEB & BENZINGER manner, the historical minute repeater movement with two polished steel hammers and two gongs has been awakened to enjoy a new life. The movement was completely disassembled, restored and modified to encompass a regulator indication, while the original transmission wheel has been replaced with a “mystery” wheel incorporating a specially manufactured glass inlay. All strike train parts, levers and springs were polished and beveled. The unmistakable base plate was first hand-skeletonized and hand-guilloché before being coated with the blue platinum developed by GRIEB & BENZINGER. The visible spring barrel was skeletonized by hand. Every single bridge was hand guilloché, and coated with rhodium and rose gold. Even the wheels were guilloché, and the heads of all steel screws were polished by hand and classically tempered a cornflower blue over an open flame.